According to Miami Herald writer Barry Jackson, the Miami Dolphins plethora of young CBs have looked impressive during OTAs. Four of the Dolphins’ top five cornerbacks are under the age of 25. Bobby McCain – Of the four cornerbacks under 25, McCain earned our highest PFF grade last season at 70.3, which ranked 67th overall out of 111 CBs. 399 of his 433 coverage snaps came while defending the slot last season. McCain’s 10.6 cover snaps per reception allowed ranked 14th among 52 eligible slot corners. 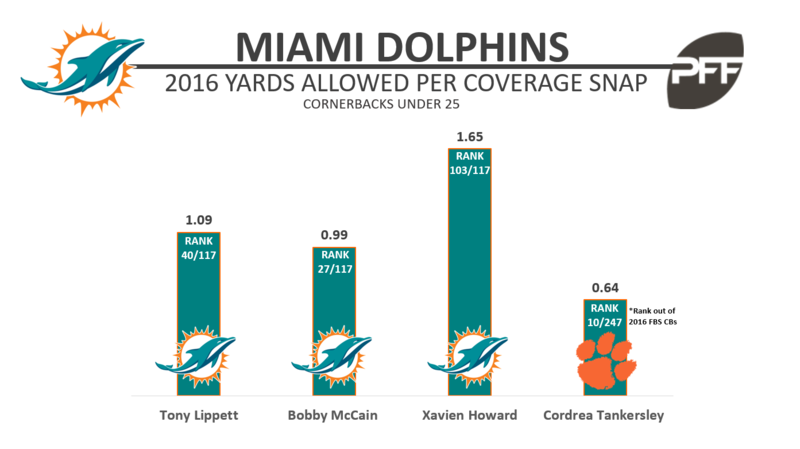 Tony Lippett – In 2016, Lippett played more snaps (862) than any other Miami cornerback. While playing RCB he allowed a catch rate of just 64.5 percent. All four of his INTs occurred when playing RCB. Xavien Howard – Howard, a second-round pick in 2016, struggled as a rookie. His overall grade of 63.9 ranked 77th out 111 CBs. Howard allowed 1.65 yards per coverage snap, which ranked 103rd out of 117 eligible corners. Cordrea Tankersley – Tankersley, an incoming rookie drafted in the third round of this year’s draft, was 39th on our PFF big board during the draft process. Impressive in college, he allowed a passer rating against of just 41.2 over two full seasons as a starter at Clemson.